The Best Leadership Podcasts from thousands of Leadership Podcasts on the web using search and social metrics. Subscribe to these audio podcasts because they are actively working to educate, inspire, and empower their readers with frequent updates and high-quality episodes. 2.25 The Super Fantastic Leadership Show! Leadership Podcast newsletter is a comprehensive summary of the day's most important audio podcasts episodes from the best podcasters on the web, and delivered to your email inbox each morning. To subscribe, simply provide us with your email address. Florida, USA About Podcast John C. Maxwell, a #1 New York Times bestselling author, coach and speaker, has sold 30 million books. He has been called the #1 leader in business by the AMA and the world's most influential leadership expert by Inc. His organizations-The John Maxwell Company, The John Maxwell Team, EQUIP, and the John Maxwell Leadership Foundation-have trained millions of leaders from every nation. Facebook fans 2,752,687. Twitter followers 2,562,021. Nashville, TN About Podcast Short-term wins are easy. Sustained achievement is another story. On Lead to Win join New York Times bestselling author Michael Hyatt and discover how current research combines with timeless wisdom for lasting success. From personal productivity to personal development, self-leadership to team leadership, and intentionality to influence, get the insights and tools you need to win at work and succeed at life. Facebook fans 299,086. Twitter followers 287,861. Barrie Ontario Canada About Podcast Carey Nieuwhof is a former lawyer and founding pastor of Connexus Church. He's the author of several best-selling books, including his latest, Didn't See It Coming, and speaks to leaders around the world about leadership, change and personal growth. Facebook fans 28,892. Twitter followers 28,336. About Podcast Keep up with Leadership and Discipline posts from Jocko podcast. Facebook fans 20,233. Twitter followers 236,469. About Podcast Catalyst exists to equip and empower leaders who love the Church through events, content, and community. Basically, we fuel leaders and have fun doing it. Facebook fans 50,655. Twitter followers 108,434. Dayton, OH About Podcast Leaders are learners. The best leaders never stop working to make themselves better. As Kobe Bryant once said, "There is power in understanding the journey of others to help create your own." That's really why the Learning Leader Show exists. To come together to understand the journey successful leaders are on so that we can better understand our own. Facebook fans 1,836. Twitter followers 3,392. New York About Podcast Join the conversation with today's thought leaders on how to become a more powerful, courageous and effective leader. Facebook fans 4,646. Twitter followers 12,999. About Podcast Join conversations designed to help leaders go further faster by subscribing to the Andy Stanley Leadership Podcast. Each month, Andy discusses leadership principles developed over 20 years of leading a multifaceted organization and interviewing incredible leaders that are making huge impacts on their organizations and communities. Facebook fans 11,512. Twitter followers 591,510. South Carolina About Podcast Perry Noble will be the first to say that there's no secret formula for being a successful leader, but there is a PERFECT example - Jesus Christ. This podcast is for those who are ready to be challenged in their faith and stretched as leaders and for those willing to do whatever it takes to be more like Jesus. Facebook fans 106,620. Twitter followers 180,775. Jupiter, Florida About Podcast Would you like your business — and your life — to be a lot more fun, a lot less stressful, and a lot more profitable? Do you want to sell more, lead better, be more influential, and live a life of significance? In this show, based around the Five Laws of Stratospheric Success from the international bestseller, “The Go-Giver”, you'll learn how to naturally create a life of joy and prosperity. Your host, Bob Burg, coauthor of “The Go-Giver” will share his insights and interview notables including today’s top entrepreneurs, business and thought leaders. Facebook fans 1,843. Twitter followers 112,203. Cincinnati, Ohio, USA About Podcast Based on interviews with 100 executives and leaders at dozens of successful companies around the world as they learned their most important leadership lessons - sometimes the hard way. Featuring stories from executives at Procter & Gamble, Dollar General, Hewlett Packard, Kellogg's, Dun & Bradstreet, Saatchi & Saatchi, Verizon, and many more. Each episode brings you an important lesson through a single compelling story. Facebook fans 2,892. Twitter followers 2,801. About Podcast Hosted by Richard Rierson, the Dose of Leadership Podcast is the ultimate resource of inspiring & educational interviews with relevant and motivating leaders; real-life leadership & influence experts who dedicate their lives to the pursuit of the truth, common sense, & courageous leadership. The podcast interviews leaders from all aspects of life; business leaders, entrepreneurs, authors, speakers, military heroes, faith based leaders - all are highlighted on the Dose of Leadership Podcast. Facebook fans 1,922. Twitter followers 2,078. Michigan About Podcast The Engaging Leader podcast is an audio program where Jesse and his guests share communication and leadership principles, and tell stories that illustrate putting those principles into practice. The podcast typically lasts about a half-hour and is published on the 1st and 15th of each month, but you can listen whenever it is convenient for you. It is a great way to keep your mind productive while you are driving, exercising, or otherwise occupied. Facebook fans 315. Twitter followers 2,051. About Podcast If you are ready to claim your power and change the world, then join women empowerment expert Eleanor Beaton for Fierce Feminine Leadership. Each week, Eleanor shares inspiring interviews with powerful women in business, along with practical tools and tricks you can use today to step into your power, smash your glass ceiling and take your seat at the tables where the big deals and decisions are made. Facebook fans 2,125. Twitter followers 3,550. Atlanta, GA About Podcast Develop leadership skills and understand leadership development from expert interviews with transformational leaders. Leaders in the Trenches gives raw discussions that dive deep into new strategies to accelerate your company growth and your leadership abilities. Get interviews from Fortune 100 leaders to experts in various domains of marketing, sales, and leadership that allows you to explode your growth. Learn from their failures and discover the finer elements of significance that will impact your company. Facebook fans 811. Twitter followers 4,278. New York City, San Diego About Podcast Accelerate! primarily targets sales leaders, but it touches on fields that range from leadership to lead generation. Facebook fans 10,158. Twitter followers 17,327. Houston, TX About Podcast Learn to build, run, and keep great teams from Vanderbloemen Search Group. We cross paths with church leaders on the front lines of ministry every day. Whether we're helping build church staff teams during seasons of growth or advising church leaders during a tumultuous transition, we've witnessed incredible stories of God working in the Kingdom. These are the stories of those leaders. The ones that have built great teams, recovered after failure, weathered seasons of decline, or are currently in process of becoming better leaders. Facebook fans 10,183. Twitter followers 82,885. Denver, CO About Podcast Our mission is to equip and inspire leaders to accomplish what God has inspired in them. There comes a point in life where one desires to live a life of significance. The Eternal Leadership podcast brings you expert thought leaders on life, business, relationships and faith to provide clarity and solutions to the complex issues leaders face every day! Facebook fans 1,113. Twitter followers 13,640. Washington DC About Podcast Get business insights and expert tips... served with a side of shenanigans and a crapload of nice. Subscribe to The Nice Guys Podcast so you don't miss an episode. Our promise statement to you: To provide an experience that is entertaining and adds value to your life. Hosted by Doug Sandler and Strickland Bonner. Facebook fans n/a. Twitter followers 36,750. Vancouver About Podcast The Audio Experience of eavesdropping on the most interesting conversation in the personal and professional leadership world! This is the World-wide #1 Fortune 500 Podcast, and Inc Magazine Top Podcast for Next-Gen Leadership and Business Families!Dov Baron's Leadership and Loyalty Show focuses on inspiring those who lead to live deeply meaningful, purpose driven lives that are heart, soul and mind aligned. So that you can have not only the success, but also the fulfilment that allows you to make the massive difference you came here to make, and be an extraordinary leader with a cult like following! Facebook fans 12,401. Twitter followers 14,988. About Podcast We interview great leaders, review the books they read, and speak with highly influential authors who study them. Facebook fans 4,873. Twitter followers 352. Pittsburgh, PA About Podcast L3 Leadership exists to build and develop a community of leaders that grow to their maximum potential, develop the courage to pursue their dreams, and to become great leaders in their families, communities, cities, nations, and their world. We do this through monthly breakfasts, mastermind groups, service opportunities, and leadership events. Facebook fans 1,043. Twitter followers 364. About Podcast On this leadership podcast, Kevin Kruse of LEADx interviews top leadership experts & business executives for their best career advice and management tips. Facebook fans 13,524. Twitter followers 759. 25. The Super Fantastic Leadership Show! Chicago About Podcast This is the leadership podcast devoted to supporting you in leading at the highest levels of effectiveness and the greatest levels of fun. Discover your genius with Daphne Scott. Join the evolved leadership movement, get expert coaching, and live a Leadership Life. Facebook fans 1,544. Twitter followers 1,657. About Podcast In the Garage to Goliath podcast, marquee leadership speaker, entrepreneur, and host, Dan Quiggle, introduces you to unsung leadership, business, and entrepreneurial heroes. Dan travels the world as a leadership keynote speaker and meets the most successful, positive, and inspiring leaders. With Garage to Goliath, Leaders Building Legacies podcast, you get to learn from the best, how to be your best and in turn lead well, lead with purpose, impact lives and communities, and build a lasting leadership legacy. Facebook fans 482. Twitter followers 38. Facebook fans n/a. Twitter followers 46,174. About Podcast An ongoing series of Executive Coaching Tips designed to help you be perceived in the workplace the way you want to be perceived. 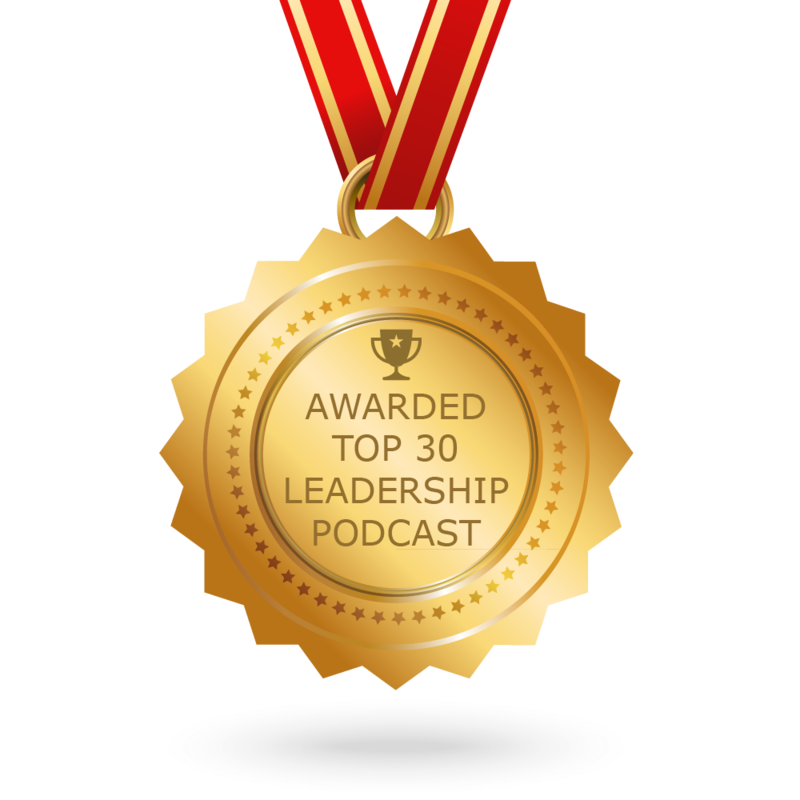 CONGRATULATIONS to every podcast that has made this Top Leadership Podcasts list! This is the most comprehensive list of best Leadership Podcasts on the internet and I’m honoured to have you as part of this! I personally give you a high-five and want to thank you for your contribution to this world.